"[Hock's] clear and useful guide will help anyone interested in going beyond Google, explaining when, why, and how best to use various search tools and other web resources." 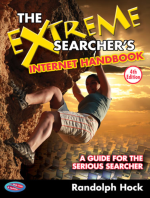 In this fully updated fourth edition of The Extreme Searcher's Internet Handbook, award-winning writer and internet trainer Ran Hock covers strategies and tools—including search engines, directories, portals, and social networks—for all major areas of internet content. Readers with little to moderate searching experience will appreciate Hock's helpful, easy-to-follow advice, while experienced searchers will discover a wealth of new ideas, techniques, and resources. Anyone who teaches the internet will find this book indispensable. "Should be required reading for librarians, online professionals, and anyone else who wants to get the most out of the Internet. Recommended." "A great how-to guide by one of the world's foremost search trainers."